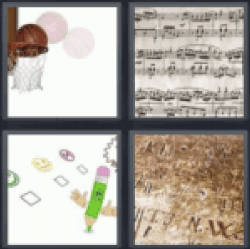 4 Pics 1 Word Basketball going into hoop. Musical notes. Green pencil with hands. Old stone etchings. Find the 4 pics 1 word answers you need and still have fun with the game that has hooked millions of people. 4 pics 1 word basketball.